Hello, my wonderful friends. 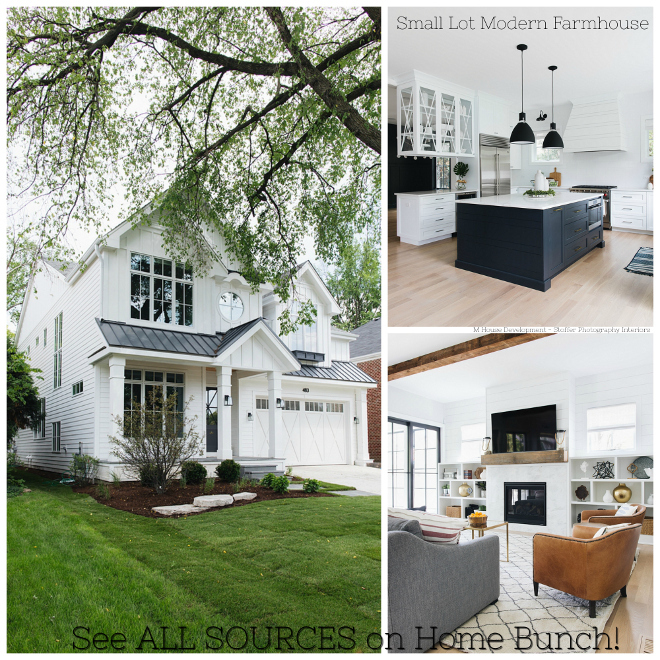 This new “Beautiful Homes of Instagram” is so special to me and I am so happy to be sharing it with you today. 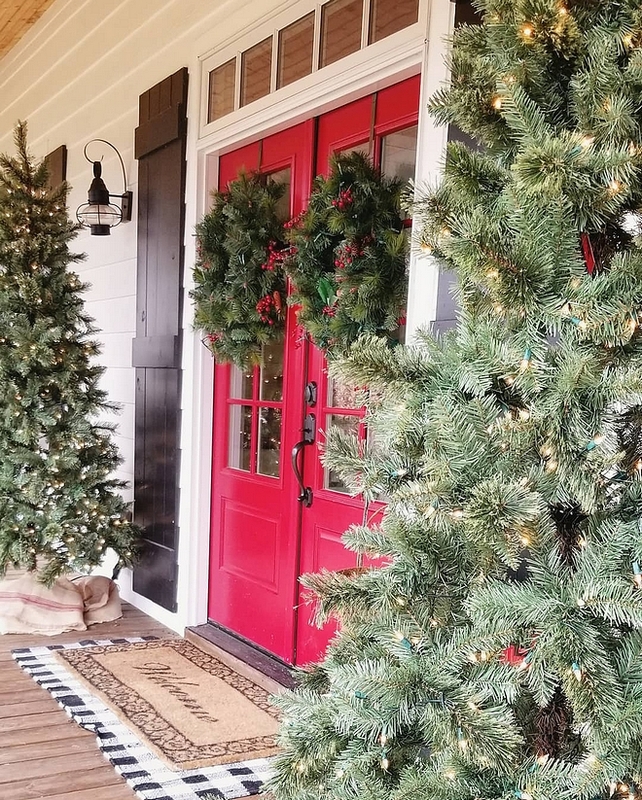 My dear friend Chasitiy of @lovehurtts was previously featured on “Beautiful Homes of Instagram” series earlier this year and she is back on the blog with her home all decorated for Christmas! What a treat!!! Honestly speaking, of all people you must follow on Instagram, Chasitiy is one you really can’t leave out of your feed. I grew up hearing my late grandmother telling me how important it is to choose the right people we surround ourselves with and the more I live, the more I see the importance of having good people in my life. Chasitiy is one of those people you feel good whenever you hear from them. Her energy is beautiful and I think that’s why I feel good every time I look at her home. You feel how calm this place is and a real feeling of peace comes to you. “Hello once again everyone! I am Chasitiy Hurtt of @lovehurtts. It’s my favorite time of year, when the fireplace is filled with a cozy fire, the only light in our home is the warm glow of the Christmas tree lights, and of course… spending extra time with our loved ones. 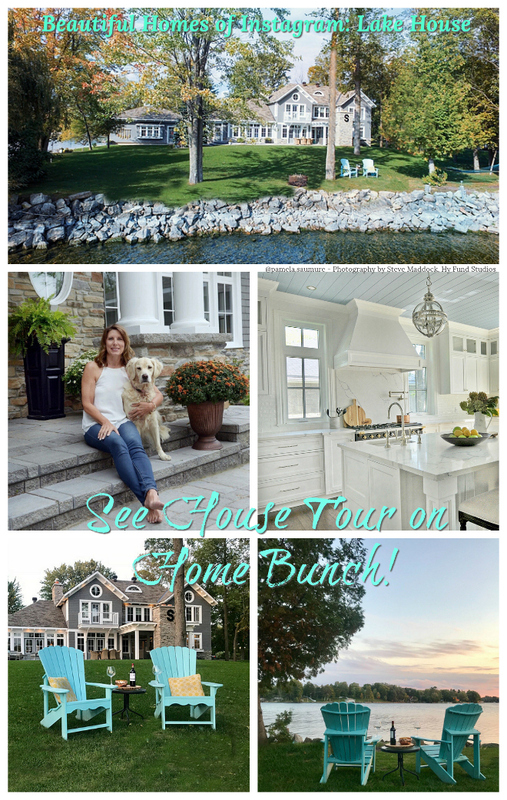 I had the privilege of being featured in “Beautiful Homes of Instagram” back in May of this year – And I will forever be grateful for the experience. Now, to have the ability to be apart of this community once again during the most magical time of year is nothing short of a dream come true. Getting a deeper look into some of these great accounts during the Christmas season, which are mainly driven by such incredible women, has given me a better understanding of this lovely community that Luciane has gracefully helped foster. 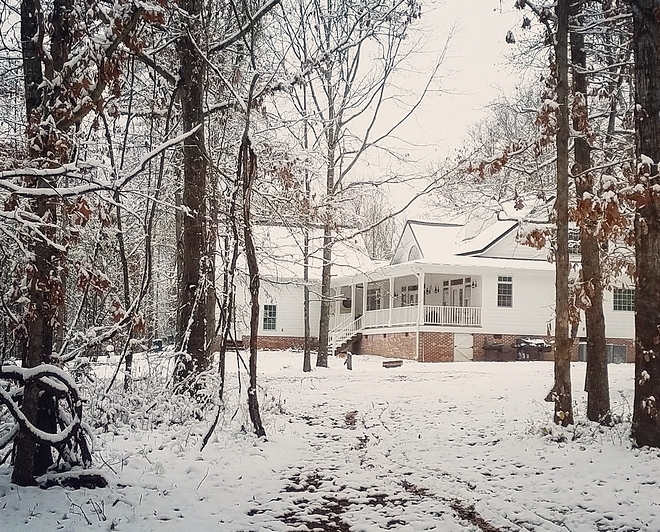 Located in Northwest Georgia – in a town I actually grew up in – our home is built on the highest point of our community. Villanow is a town that can only be classified as extremely quaint, living “out in the country,” and everyone will ask what your last name is to trace back how they may know you or your relatives. It’s also not uncommon for anyone who ever talks about my beloved Villanow to describe it as “God’s Country” – It’s breathtakingly scenic, and utterly timeless! 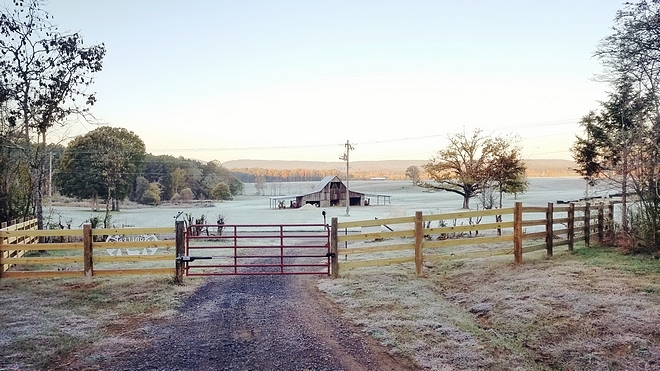 We rarely get “snow”… Maybe a dusting or two a year, but when we do… our little town of Villanow puts on a show. The way the land lays, the snow blankets the rolling hills/ridges, and literally has the ability to take your breath away. 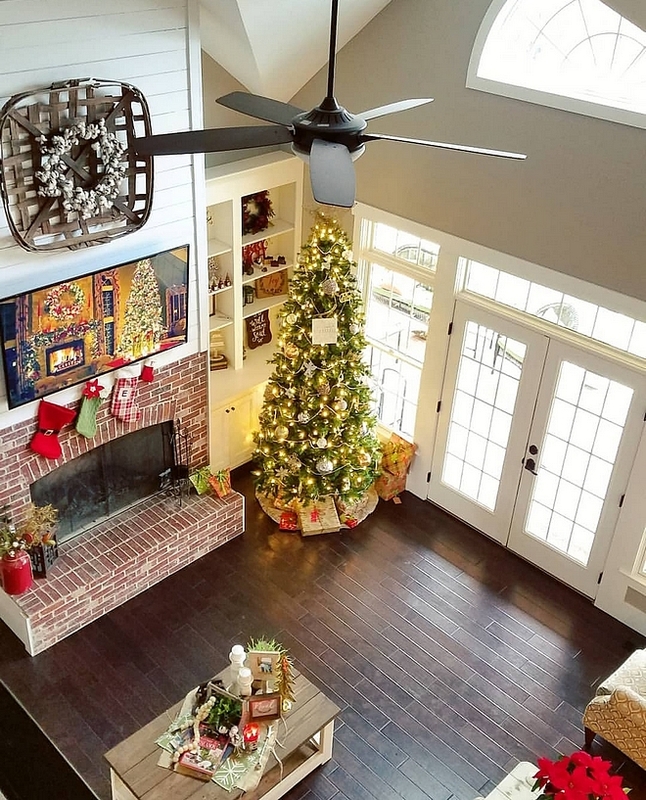 You will notice, during Christmastime, all bets are off when it comes to decor & most areas are far from simple. Some go for a more neutral look in their homes, but I’ve always been drawn to a more vintage look incorporating color, classic patterns, and layers of coziness. We have 4 fully decorated Christmas trees in our home, mainly because each room has it’s own style, which gives the opportunity to style each tree with it’s own unique flair. 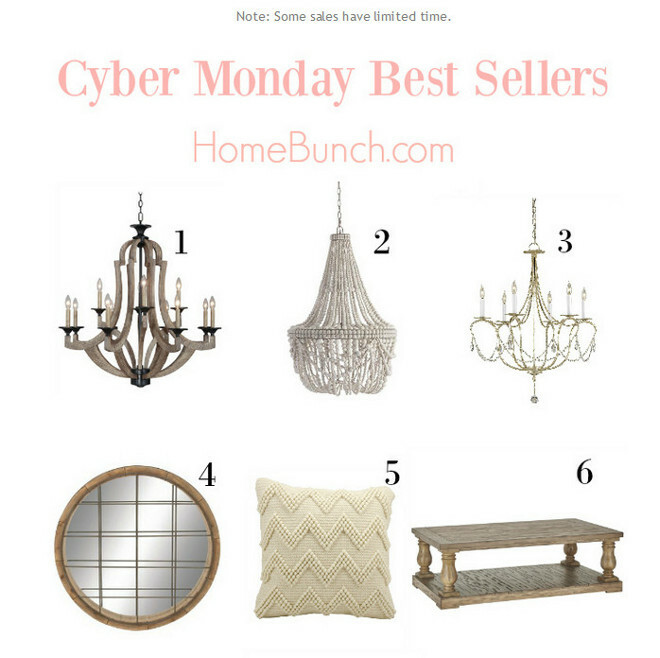 When discussing home decor/design, I always try to be transparent in that I do not have a formal design background, however, home decor has become an outlet for me over the years, and now can be defined more as a passion. I am always eager to create the next welcoming space… whatever that may be. 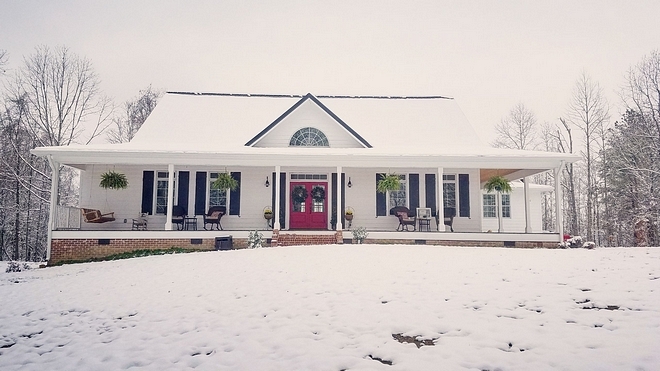 I guess you could say my passion for design all started when Richard (my husband) and I purchased 55 acres in 2014, and decided to start designing/laying out our forever home roughly four years ago. 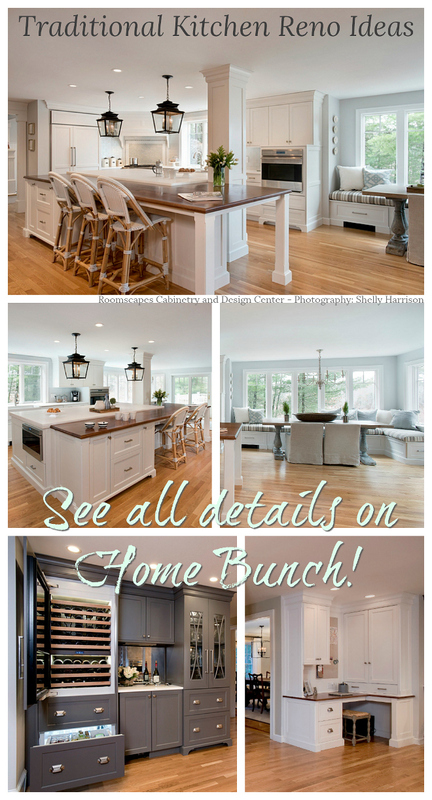 I was researching, pinning, comparing, and analyzing every single detail of what I envisioned this home to be. When combing through thousands of house plans, we just couldn’t find THE one, and I just wasn’t willing to settle. After becoming somewhat discouraged we later discovered this dead-end was in fact a blessing. It was at that point that we were determined that if we couldn’t find the perfect home, then it could be created…from scratch. We started off by taking elements from all of the house plans that we loved, and create the home we wanted to fit our needs. Richard, being an engineer, was able to take all of my thoughts, crazy ideas, countless changes and transfer them into a buildable blueprint. Thankfully we both thrive off of symmetry, so he was able to incorporate detailed design components for balance – which is a common thread throughout our entire home. Since we were starting with a fresh slate – and by fresh…It was all wood, and had only been used as a deer-camp for hunters for the past 25 years, so it was completely overgrown. Starting with bulldozing a new 2,000 driveway, we set the tone for how our future guests would arrive to “Hurtt Holler” . We had actually visited the Biltmore in NC around that time, and thought it would be really neat to model a winding driveway (obviously a very scaled down version) after their entrance. We have plans to incorporate mini-vignettes over the years to try to recreate the Biltmore’s welcoming feel as you drive up. 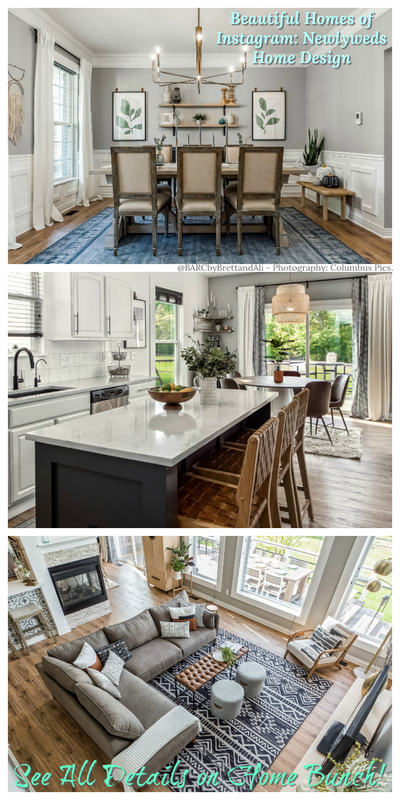 The next element of design was based on another factor – I love to entertain, and as many have stated in the past, an open floor plan and large porches would allow us to host large sized gatherings and parties. We also achieved maximum privacy being on a hill, completely surrounded by woods, and the closest neighbor cannot be seen standing from any point inside or outside of our home. 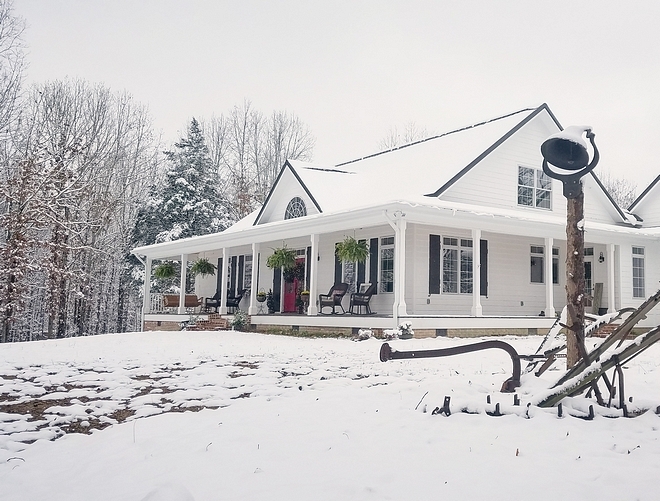 Wild muscadine vines, large oaks as far as the eye can see, and watching unparalleled sunsets with a ridge outline are just naming a few of my favorite features of our woodland retreat. 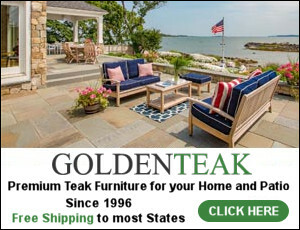 In building any home yourself, we still have a decent list of home projects that still remain, with landscaping being our main objective this year. With that said, I truly like to look back through pictures to see how much we have actually accomplished in the past two and a half years. 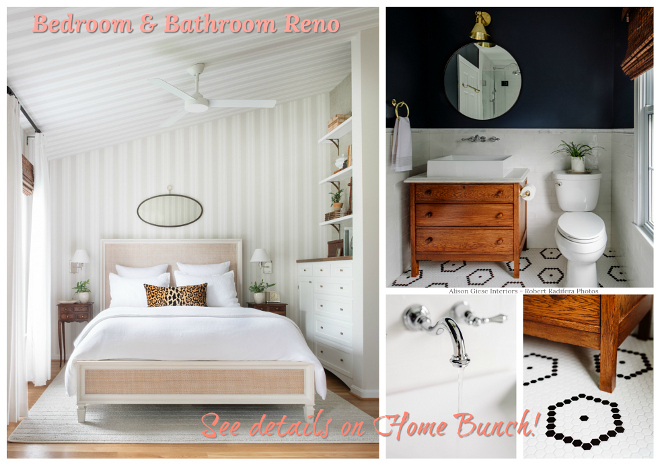 As you will notice within this article, my design style has a heavy french-country influence, with an accent of vintage flair, and a splash of craftsman to accomplish clean lines. I am inspired by layered textures, contrasts in colors, while always trying to remain classic. 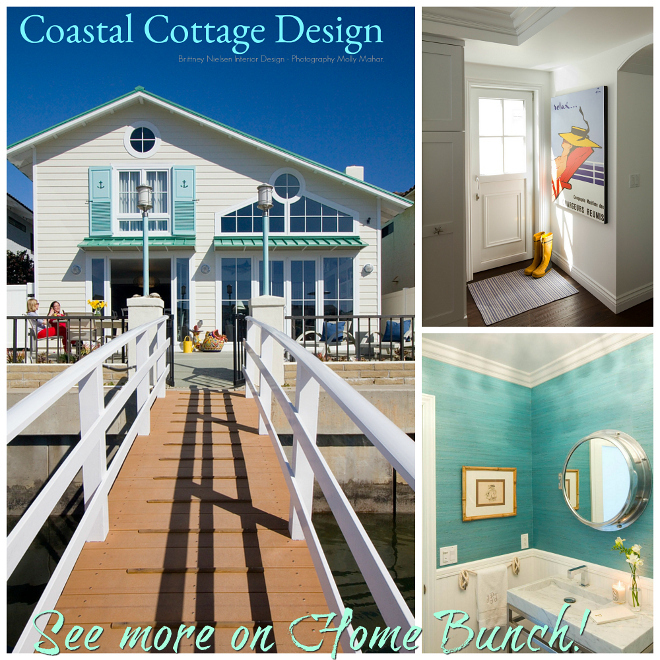 When designing our home, I appreciated the fact that the exterior of the home is the first thing our guests would see. So, I wanted it to make a classic yet Southern impression. We positioned the home right next to one of the largest Oak trees on the property – which is named the “General” for obvious reasons. 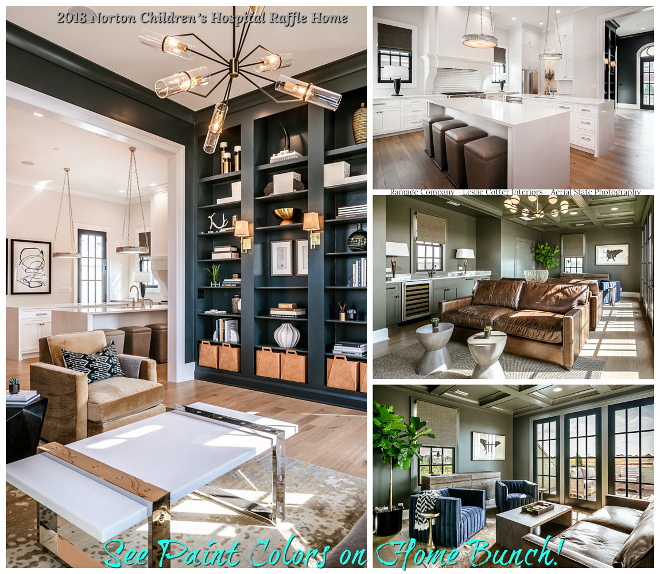 From the paint colors, light fixtures, wicker rocking chairs, eye catching color of the double doors, transom windows are all details in their designated place for this very reason. The front of the house is “Select Cedar Mill” Hardie Siding painted with Sherwin Williams Extra White SW 7006 paint. The double front door is from Pella Windows, and came factory painted with Sherwin Williams Pure Red SW 6868. Similar Red Front Door: Here. Similar “Welcome” Doormat: Here & Here. 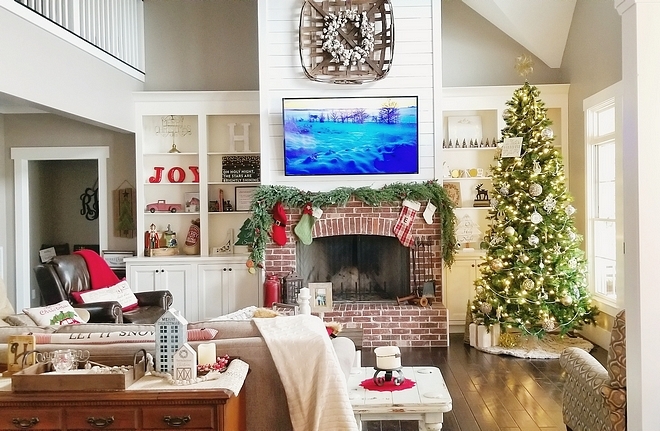 My favorite area of our home to decorate… especially during Christmas! 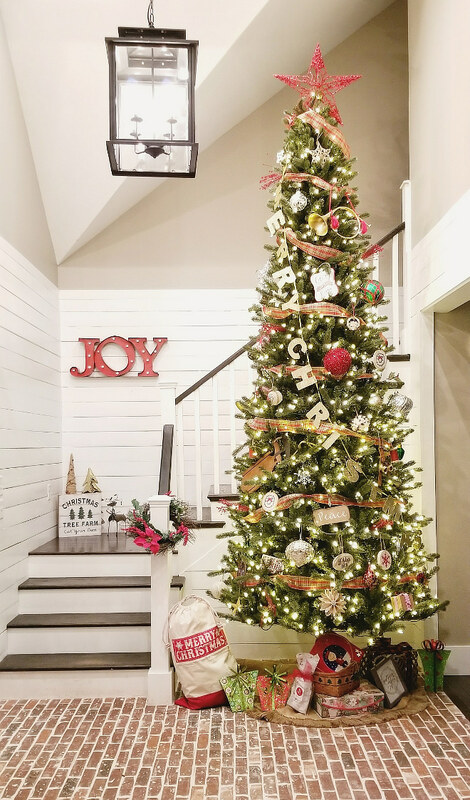 While building our home, I envisioned an extraordinary large Christmas Tree to greet our guests as soon as they walked through our front double doors. With that dream coming true, a 12 foot Christmas tree now stands tall in this space. 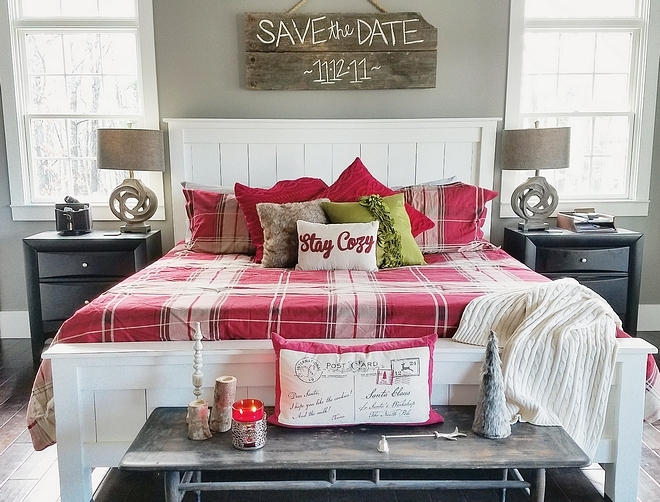 The styling is classic farmhouse with little pops of patterns and assortment of reds. I get asked about the flooring choice in this space more than anything in our home. 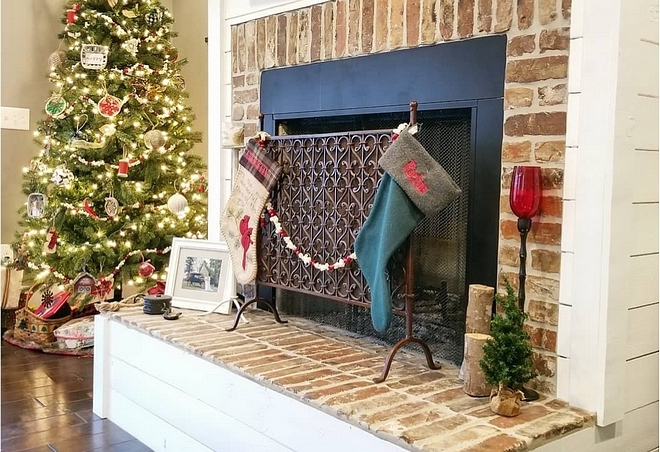 Having lived in Louisiana for a few years, I loved the classic, nostalgic feel of a brick floor and wanted to bring it home. It’s the very first thing people see when entering, and it’s always a wow reaction. 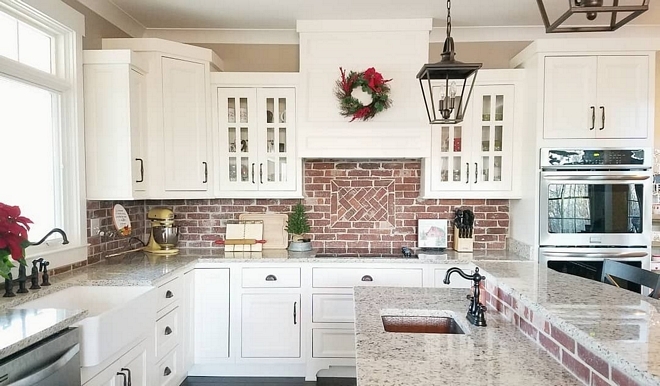 Brick is so classic, and adds so much more than texture to any space. I decided to use the same “Old Louisville Tudor” brick by General Shale but in a thin brick to make it cohesive to the exterior design. We added shiplap (real shiplap) painted Sherwin Williams Extra White in the two story foyer as well to give the brick a softer contrast. The wall color above is Perfect Greige SW 6073 by Sherwin Williams. The light fixture in the foyer was our “splurge” for this space – Calisse 4-light Pendant by Ballard Designs. I used a craftsman design for the staircase and interior door underneath. Again, this is to achieve the straight/clean lines in a sea of textures. Similar Lighting: here, here, here, here & here. The dining room is just to the right after entering the home. I incorporated glass double doors with transom for this space as well to have a “draw in affect”. 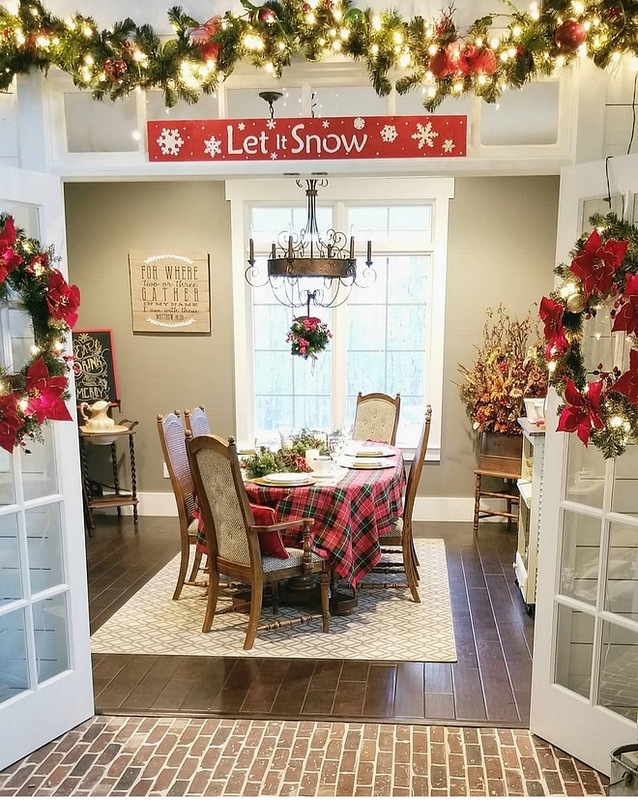 I always hang wreaths for every season on these double doors, because I’ve always seen it as a sign of welcoming your guests. The Christmas wreaths I chose are again, full of color, and have poinsettias with the glow of Christmas lights. The walls are SW 7018 Dovetail with SW 7006 Extra White Trim by Sherwin Williams. The whimsical chandelier is the crown jewel in the center of this space. It is 30” Wide Rust Candelabra Chandelier by Franklin Iron Works. The windows are Pella Aluminum clad casement windows with transoms. This room in surrounded by the porch, so you virtually feel as if your outside sitting with hanging ferns in view. 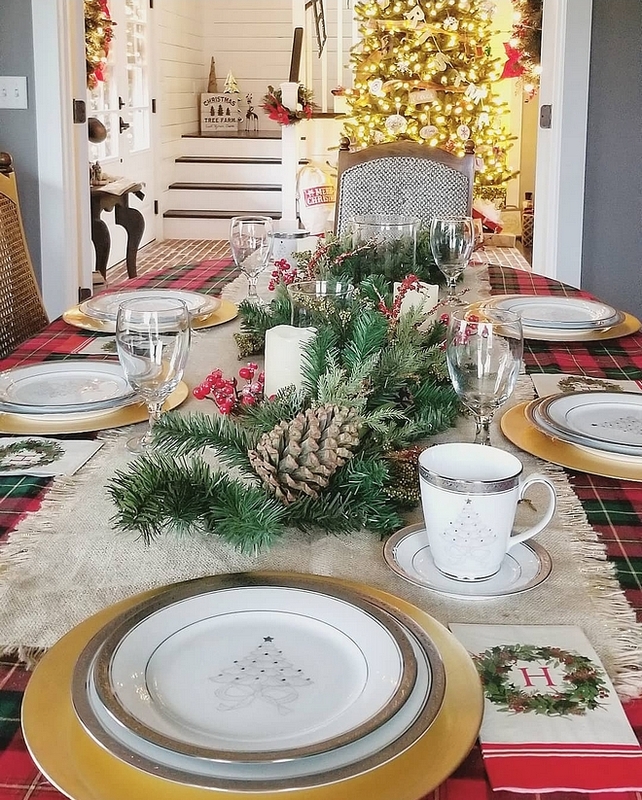 We are honored to host a Christmas Eve dinner for our close family again this year, so we truly wanted this space to be inviting, yet have a more intimate setting. With that said, we are also able to use our wedding Christmas china during such a special occasion. 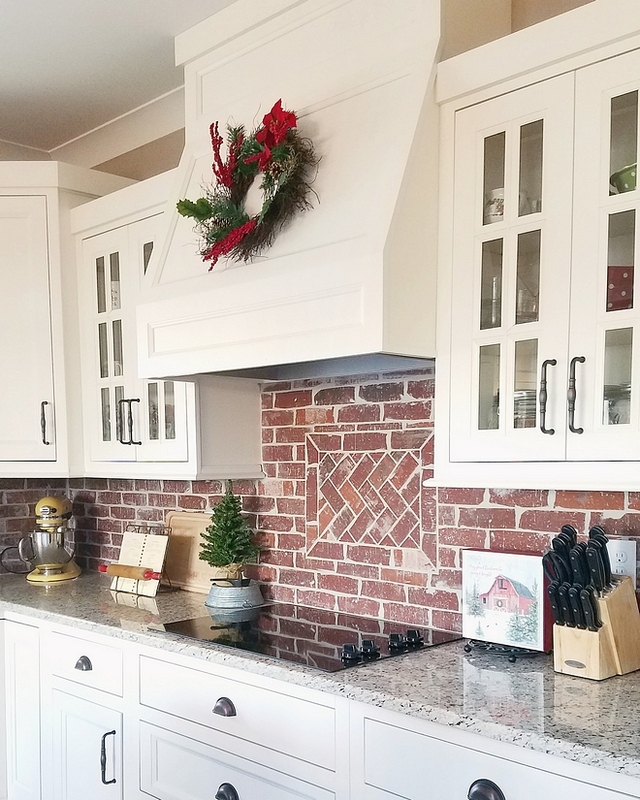 The kitchen is the only space in our home that can truly be slated as “simple” and practical when it comes to decorating for Christmas. 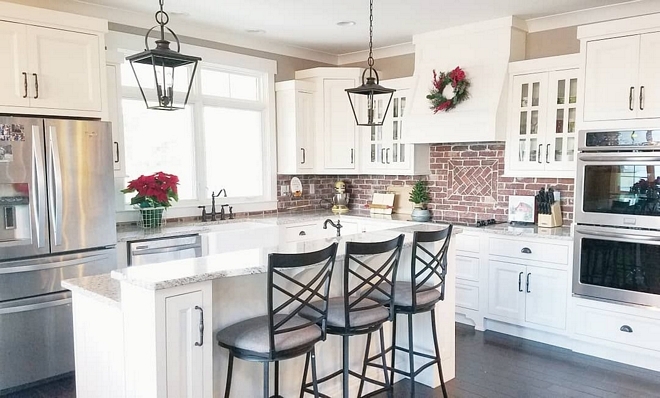 I still add a few elements & pops of red to compliment the brick backsplash, but that’s just about it. It’s important to keep this space uncluttered and more of a blank canvas each time I need to use it. Essentially, I want to be able to cook & prep (because it is a kitchen after all) in this area without having to move a ton of decorations. When designing the kitchen, I never in a million years thought I would ever want a white kitchen…Clearly, that changed. After creating a physical design board to compare while pulling everything together, I quickly decided that it was a MUST. The shaker style cabinets are recessed – painted SW 7008 Alabaster by Sherwin Williams with dark bronze hardware to pull your eyes back down. 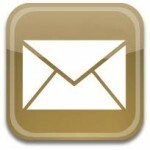 Hardware: Bin Pulls & Pulls. Countertop is Ornamental Cream Granite. 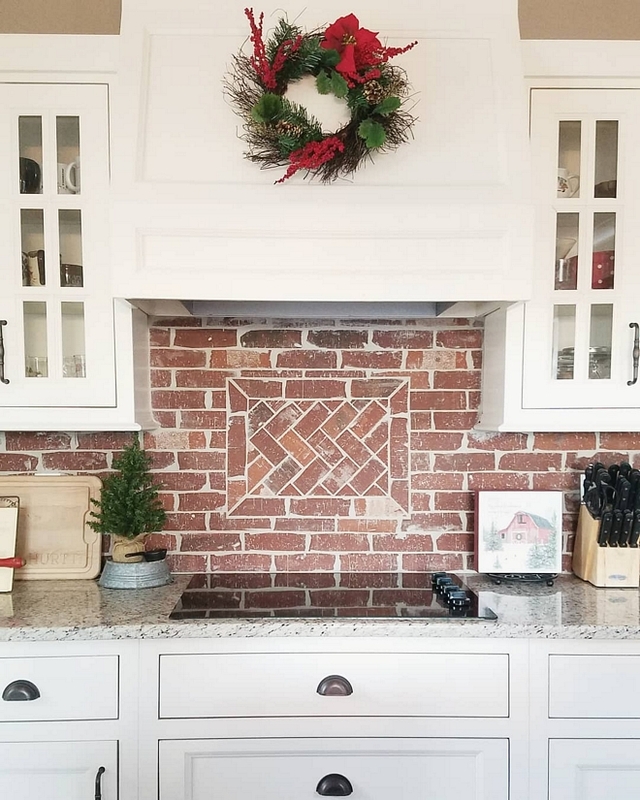 Backsplash is General Shale Old Louisville Tudor thin brick with a herringbone pattern above the range. Beautiful Wreaths: Here, Here & Here. The pendant lights above the island are Kichler. This is where my traditional decor side can thrive. Again, going with the theme of decorating each tree for the space, I chose to make this my “Silver & Gold” tree to add a more formal look to this space. 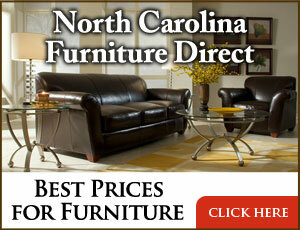 The hardwood flooring is Anderson Hardwood, Casitablanca, Monterey Grey – similar here & here. 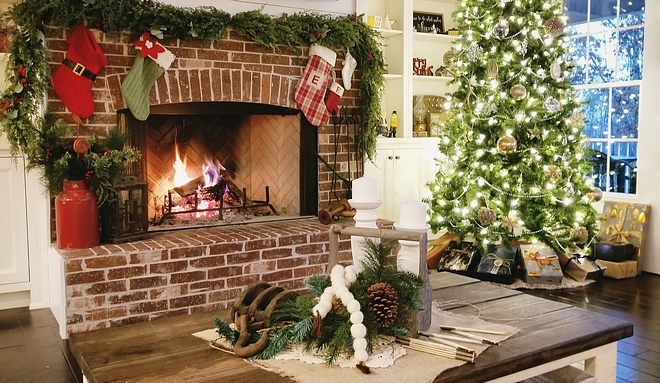 This being our main living space, there is nothing more enjoyable than to sit fireside on an extremely cold winter night in nothing but the glow of the Christmas tree. Paint color is Perfect Greige SW 6073 by Sherwin Williams. For balance, I added a lush garland and very classic stockings. When designing this room, we opted for double doors with transoms instead of windows, and couldn’t be happier with the results. All windows and doors are by Pella. We also wanted to add a wood burning fireplace (not shown) to this space, not only for functionality, but to again give it a cozy feel. This room is simple, but creates the perfect environment to unwind in as you are completely surrounded by walls of windows, and the naturalness of nature. 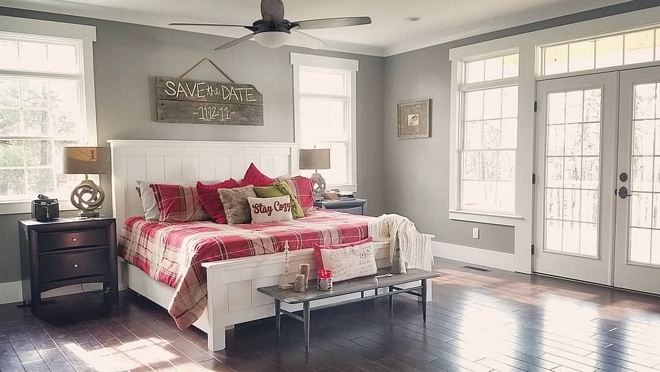 To achieve a warm yet open room with a “less is more” concept, the master bedroom is painted Sherwin Williams SW 7018 Dovetail with Sherwin Williams SW 7006 Extra White trim. The king size bed was built by Richard (my husband) while living in Louisiana, and is topped with the “Save the Date” sign we used prior to getting married. Similar Bed: Here & Here. 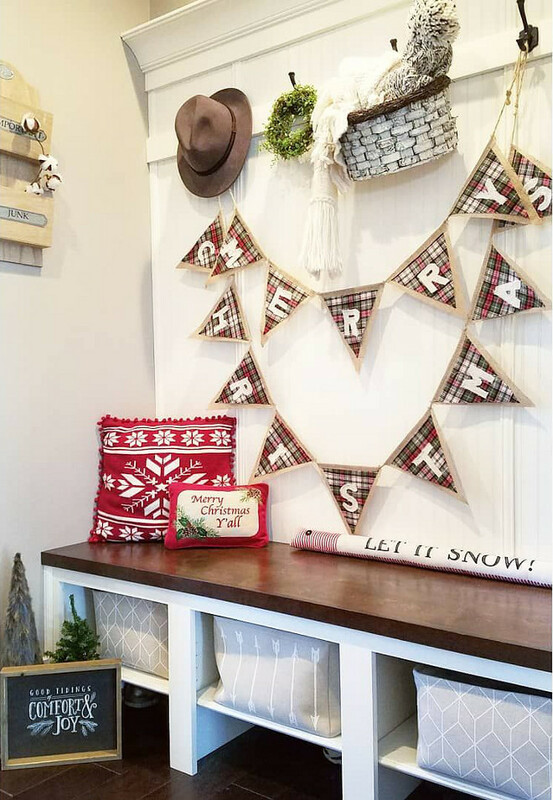 Beautiful Christmas/Winter Pillows: Here, Here, Here, Here & Here. Similar Throw: Here, Here, Here & Here. This mudroom is one of my favorites! Paint color is Sherwin Williams SW 7006 Extra White. We generally keep the exterior very simple during Christmastime, with only adding small elements of winter decor to signify the season. 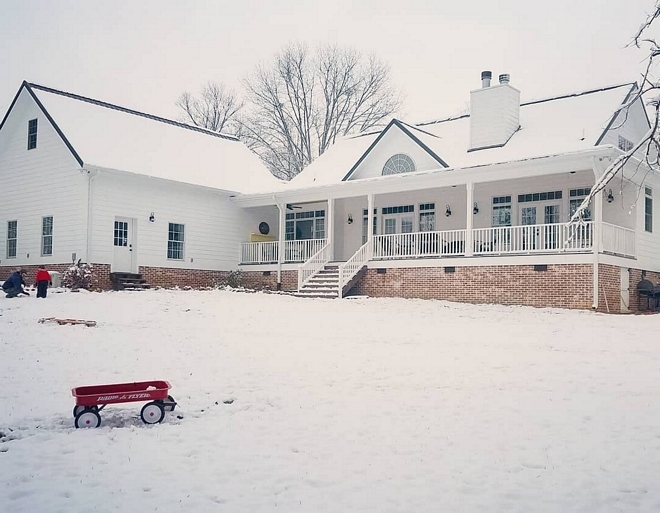 I wanted an “established” look when it came to the foundation, so we skirted the entire home with General Shale’s “Old Louisville Tudor” brick – The brick imperfections and contrast in color, make it appear as if it were an old home place. 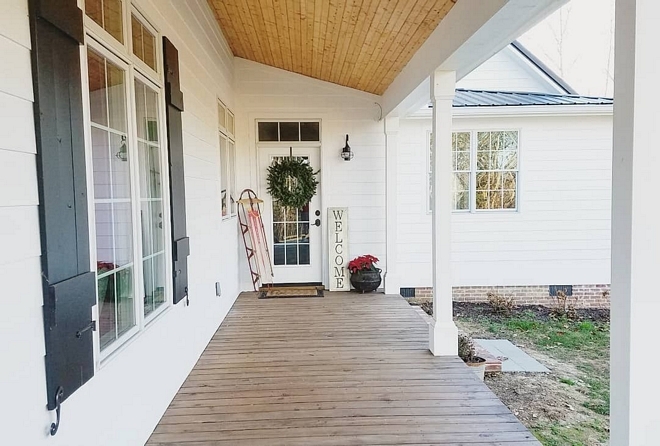 The porch is made of 5/4 x 6 pressure treated pine stained with Super Deck SW 3542 Charwood. The bead board ceiling is currently a natural finish, with plans to stain to allow the dark/golden undertones to bleed through. We handmade our own shutters out of 1 x 6 pine and are painted Tricorn Black SW 6258 – extra satin. May the peacefulness of this picture bring some joy to your heart today and throughout this Holiday season, my friends! 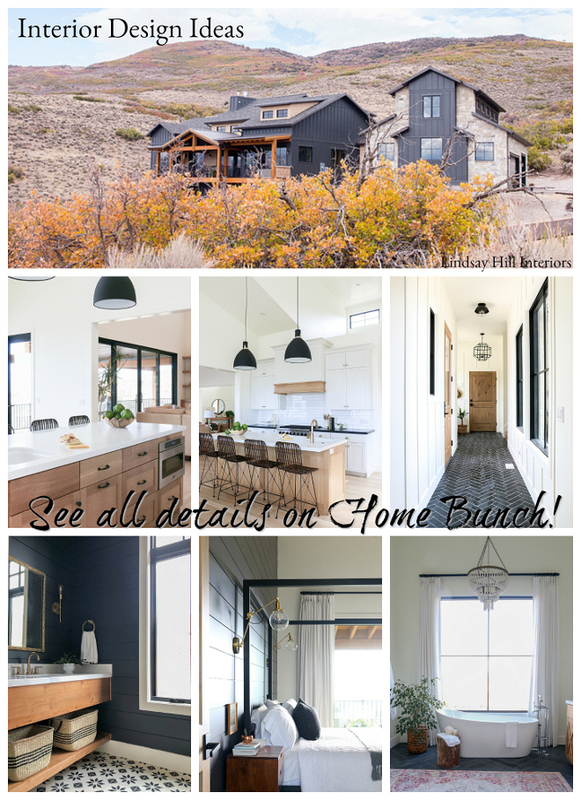 Make sure to follow @lovehurtts to see more pictures of her beautiful home!